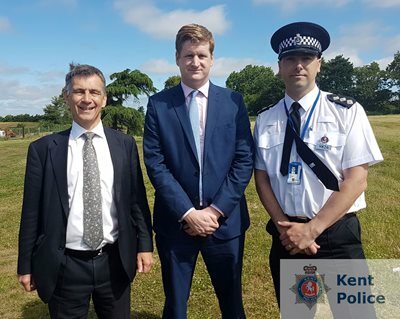 Officers from Kent Police have worked with the Kent Resource Partnership, local authorities, Kent County Council and the National Farmers Union targeting fly-tipping. On Wednesday, four warrants were executed by local officers and the Rural Task Force around the county. Six people were arrested, five in connection with fly-tipping activities, six vehicles were seized and 19 people were reported to court for various offences. The warrants took place in Canterbury, Ramsgate, Ash and Maidstone. Kent Resource Partnership Chairman Cllr Rory Love, Kent’s Police and Crime Commissioner Matthew Scott, Chief Inspector Mark Weller. Chief Inspector Mark Weller oversaw the action in Dover, he said: “This is a large scale issue which blights communities across the county. To effectively tackle this problem it is important we work alongside our colleagues from the Kent Resource Partnership and the local authorities to send a message to those illegally disposing of waste their behaviour will not be tolerated. A 53-year-old man arrested in connection with fly tipping from a house in Leigh Road, Ramsgate. Kent’s Police and Crime Commissioner Matthew Scott said: “Fly-tipping is primarily dealt with by local councils but today’s co-ordinated enforcement shows what can be achieved when the police and other partners work together. “Residents can do their bit too by reporting any suspicious behaviour to Kent Police, and by downloading the Countryeye app to report incidents of fly-tipping in their communities. In addition to the arrests officers seized 30 cannabis plants from a property in Shatterling, two people were arrested in connection with the find. Kent Resource Partnership Chairman Cllr Rory Love said: “Unscrupulous criminals are out there taking money from householders and businesses to dispose of their waste. Then they pocket the cash and dump the waste in our countryside. “And it’s the council taxpayer who picks up the bill of over £1 million – as our local authorities are forced to clear up the mess.